b) I couldn’t figure out a way to get all the colors I wanted in a similar finish, and for this one I didn’t want to mix. So, this is the palette I got, and I’m actually pretty pleased with it. A night’s worth of stitching will prove whether it will work or not! I’m hoping to play a bit more with patterns in netting, but mostly I just need to get this idea out of my head and into the beads. It’s been on my mind for days! The new medallion pendant is coming along slowly but surely. My helper picked up a first-week-of-school bug and isn’t feeling very creative at the moment, but I’m sure we’ll have some new colors added soon. It’s not always easy to admit when an idea you’ve had isn’t all that great. It can often take some time to realize it, and it definitely helps to have some outside input. I recently had a good nudge from a comment on my seed bead netting tutorial that made me realize it’s not really a tutorial at all. It’s most certainly time to give it an update. A great example of variation in simple netting. 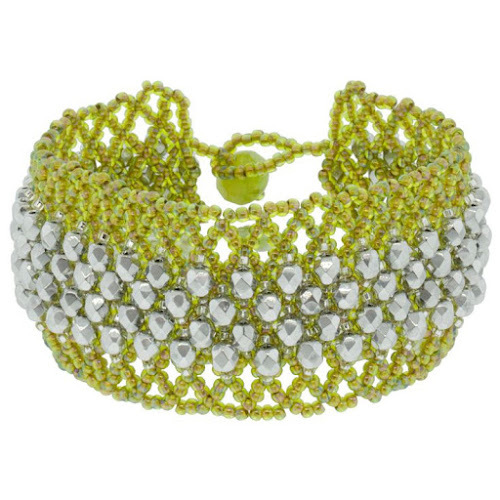 With pretty accent bead embellishments. Once you’ve tried out some basic netting or a variation of it, it’s pretty easy to incorporate your own patterns and twists to get a piece that you really like. There’s no ‘right’ way to do netting. 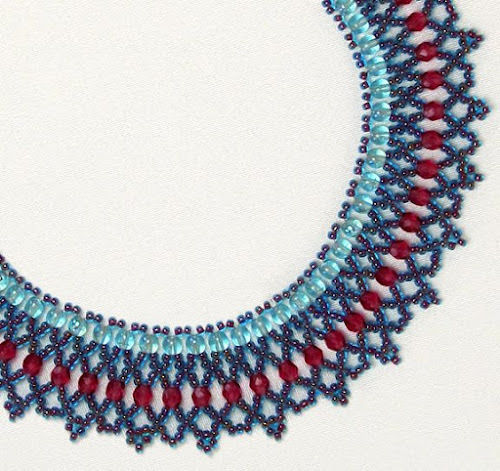 Although it’s basically just an expanded peyote stitch, it’s much more versatile and open to experiments with bead size, shape, and quantity. I’ll definitely have to add a netted collar project to my list of tutorials that I will – someday – write. 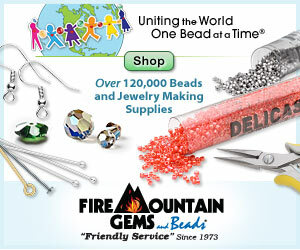 In the meantime, happy beading! Things are happening in my workspace this week, although there are a lot of them all at once and they’re all going really slowly so it feels like not much is happening at all. I’ve finished the new cuff and make a pretty big dent in my leftover seed beads, but I still have to weave in all the tails. The new medallion is started, but I still haven’t passed the first two color choices yet. Once I’ve finished added the green triangles we’ll add another layer. I’m also working on a couple of special tutorial projects with fall themes, including some veggie-inspired ombré and something candy inspired. More on those later! 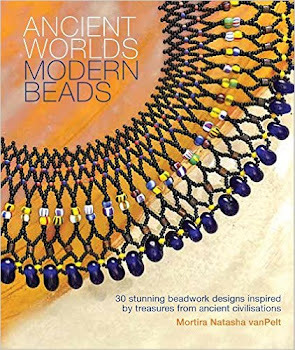 We have just under a month until the official release date of Ancient Worlds Modern Beads – although some readers have received their copies already, and the response has been great so far! Thank you so much to everyone who has given the book a chance. It’s very exciting to know that readers will soon be able to learn the techniques and draw a little inspiration from my own favorite sources. As promised, I’ve created a slideshow preview of every design featured. 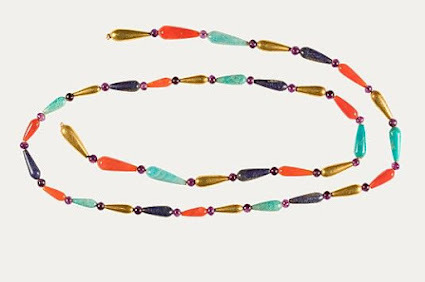 There are 30 projects in all – necklaces, bracelets, rings, and earrings all inspired by the ancient world. The video will give you chance to view all of the finished designs and some of the techniques covered in the book. I’ve only included the main designs – most projects also include examples of variations on color, materials, or style. In other words, there is a lot of jewelry squeezed into these pages! For the most part, the projects are showcased in the video by the same order you'll find them in for each chapter of the book. Each civilization has its own section, with 10 projects for different skill levels - from beginner to advanced. 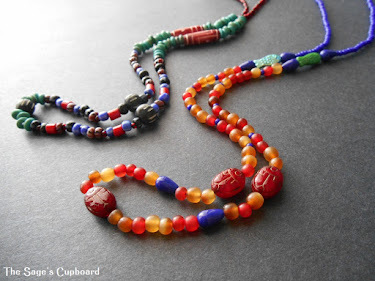 In writing Ancient Worlds Modern Beads, I did my very best to provide the same attention to detail that Inspirational Beading readers have come to expect for both basic techniques and complete projects. Each chapter is also sprinkled with extra tips for getting the best results, creating variations, or finding the best materials for a design. The inspirations are quite varied, though most projects are modelled after real ancient jewelry from Egypt, Greece, and Rome. 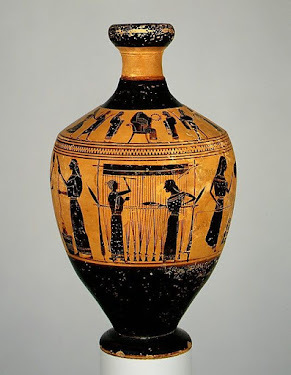 Several pieces draw on the icons of ancient deities like Juno and Demeter, while others invoke the things we admire about the classical world. 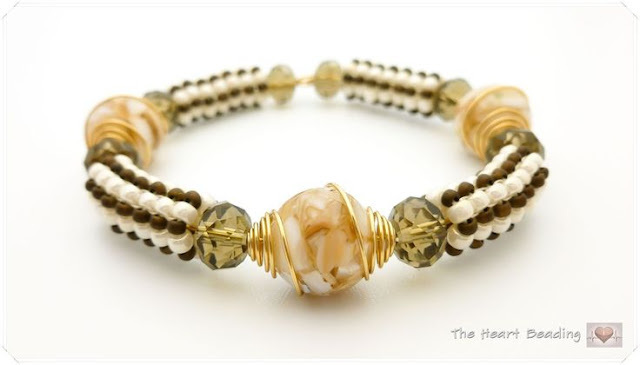 Many of my favorite designs are covered, including those that many Inspirational Beading readers have requested in the past such as the chevron collar, herringbone coil bracelet, and chevron lariat. Which project are you most interested in? Are there any techniques not covered that you’d like to see in a future tutorial or book? I would love to hear your thoughts! 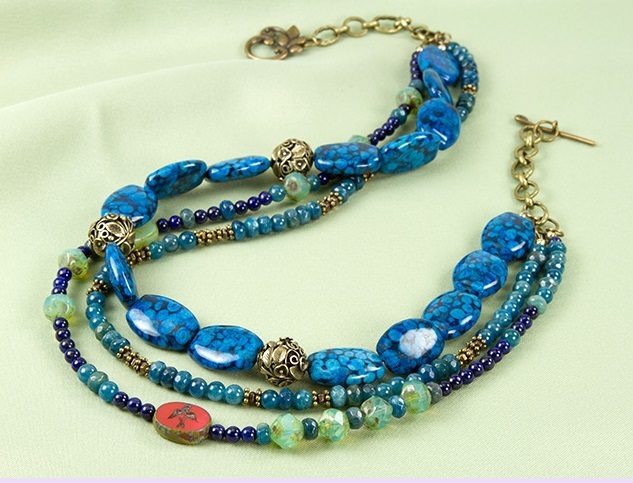 Actions you take from this post can result in a commission for Inspirational Beading. This week my bead tray is in ordered chaos as I once again tackle multiple projects at once. Over the weekend I started a new collar with a simple pattern in black and pink. I still have to finish weaving in all of the tail threads, but I couldn’t wait to move on to my next idea and get it rolling. 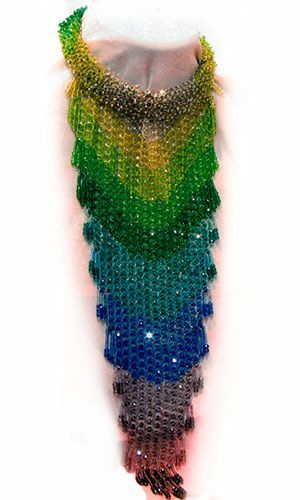 I’ve been collecting up a reserve of seed bead dregs – all of the 1 and 2 gram remainders of colors I don’t plan on stocking again. I’ve already used some of them up in colorblocked herringbone cuffs, but many colors are too low in quantity to really make a big impact. I finally thought that it would be fun to incorporate dozens of colors into a single cuff, with bold black stripes to balance everything out. This piece should help put a big dent into the leftovers. My helper and I have also picked out beads for a new embroidered medallion, starting with a dove oval and some forest green triangle seed beads. That piece will be underway once I’ve finished with the threads on the new collar. 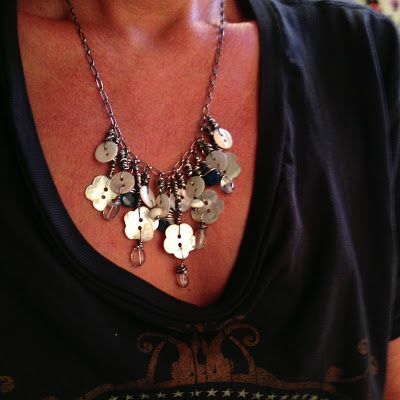 It’s been far too long since we’ve had a look at ways to style a great statement necklace. There’s something incredibly inspiring about experimenting with fashion looks for great jewelry, especially when working with a beautiful palette. For this collage, I wanted to create a little farewell to summer with pretty aqua and sandy browns. 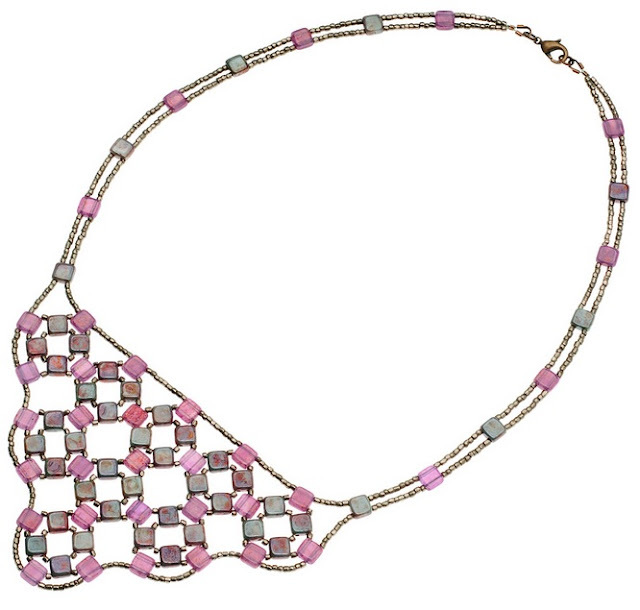 A mother of pearl bib turned out to be the perfect necklace for this palette, with its subtle blue and soft shimmer. First I paired it with a great dress in aqua blue, followed by a gorgeous taupe blouse and sea foam jeans. 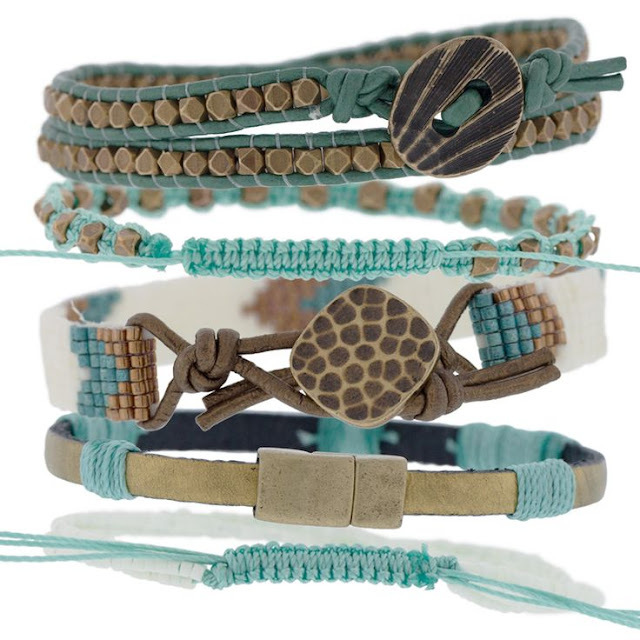 A set of gold and turquoise bangles blends perfectly with both outfits for a breezy day at the beach. What’s your favorite palette for aqua blue?